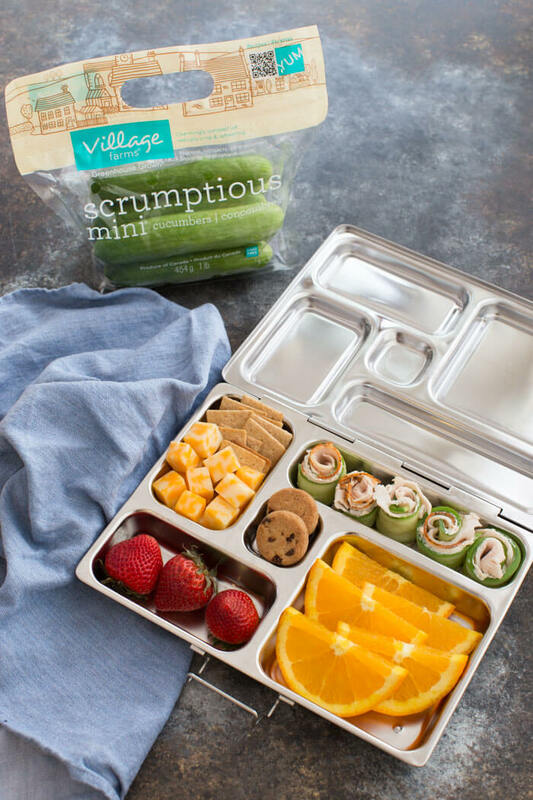 This post for Sandwich Free Kid Friendly Lunch Box Ideas is sponsored by Village Farms. Sandwich free kid friendly lunch box ideas the whole family will love. 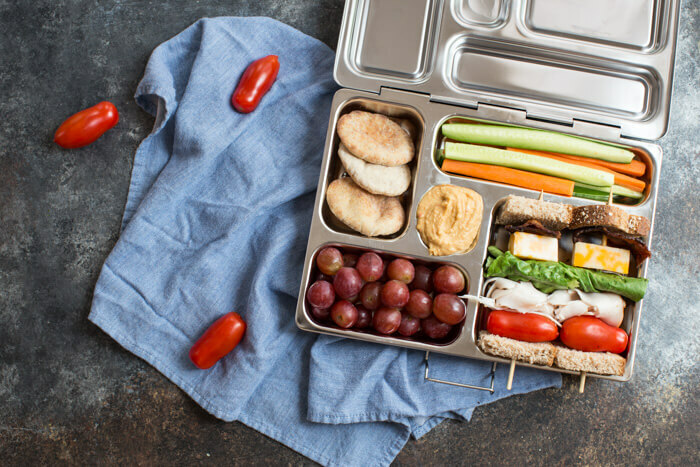 These tasty bento style lunch boxes are balanced for nutrition, color, and variety the kids will love them. My nearly 22 month old baby boy starts school today! This is a big milestone (and tear jerker) as a first time parent. 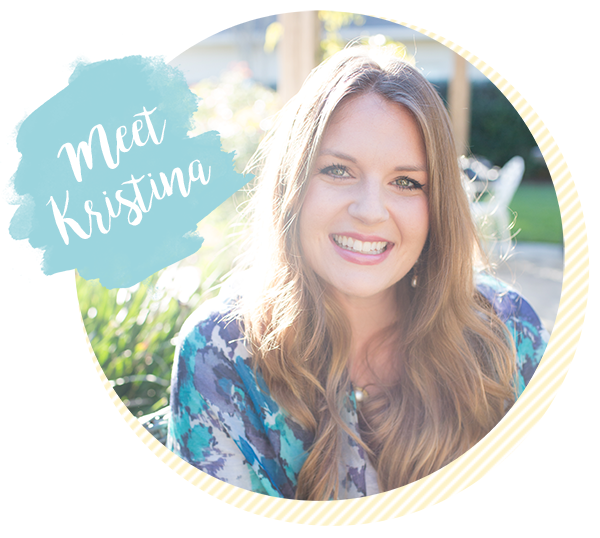 I’m so excited about this school year and the fun that little man is going to have… class parties, art, science experiments, and lots of play (can we all go back to preschool? )… but if I’m honest, I’m a little nervous about some stuff too. Will he throw temper tantrums at school like he does at home? Will he adapt to drinking from a cup instead of his sippy cup that he carries everywhere? (They don’t allow them to have sippy cups at school because kids may end up drinking after each other and spread sickness). Will he last until snack time at 11 a.m. without a hunger strike? My kid gets fed whenever he’s hungry which is often at 10 a.m. because he usually has a full breakfast in him by 7 a.m. Guess I’m going to have to encourage a good snack and hydration in the car ride on the way to school. Ahhh, so many things to worry about. He will be attending class for 3 hours two days a week, but we have the option of keeping him there two more hours for “lunch bunch”. And as a working mom, I’m sure we will be utilizing those bonus hours. So I guess that means we are entering the lunch box scene. From the beginning, feeding Parker has not been by the book. He’s a pretty good eater, but I’ve had to try different things to figure out what works for him. And I keep trying. Just because he doesn’t eat the side of veggies I give him at dinner, doesn’t mean I stop putting them on his plate. Case in point, he would NEVER eat scrambled eggs… but I still offered them to him for breakfast in the morning. He now loves eating scrambled eggs, but it all clicked for him after I made a “cooking show” out of it… I pulled his high chair up to the stove top so that he could watch me crack the eggs, scramble and cook them and top them with cheese. And after I served them to him that morning, he promptly gobbled them all up. Parents are up against a lot when it comes to their children choosing healthier foods. Between advertising, availability in school cafeterias, and the general influence of peers, parents have a lot to attempt to stand against. 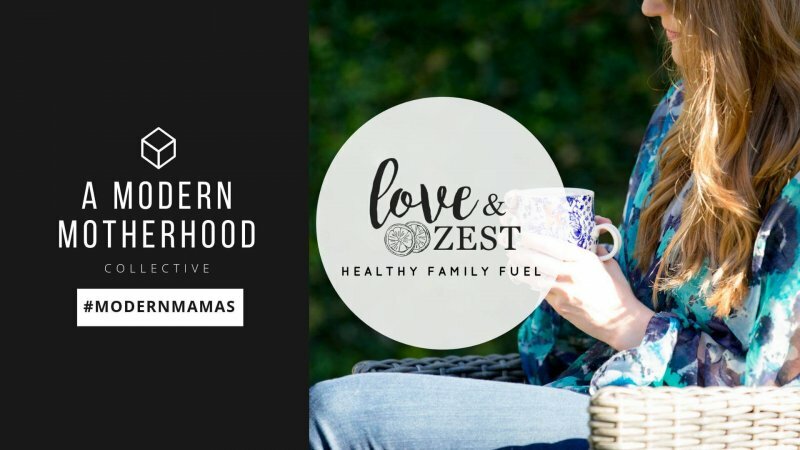 Luckily, there are many tips, tricks, and creative ideas to help with packing healthier options for our children. Balance new healthy foods with their favorites! One trick I learned pretty early on when attempting to get my little one to try new fruits and vegetables over the sweet and salty processed snacks, was to pair the healthier or more challenging options alongside some of his favorite foods (enter mini chocolate chip cookies and salty crackers). If you’re trying to get your kids to enjoy the healthier options, keep offering the ones they love but in a smaller portion alongside larger portions of the healthier option. Balance is key. Fun doesn’t only have to pertain to your kid’s lunch box design; it can also include their food. Just like adults, kids eat with their eyes so something as simple as switching up the shapes of food might make it more appealing to them. Also, color can be enticing. When you and I eat a sandwich with lettuce and tomato, we know the lettuce is green and the tomato is red, but if we display that for children the colors can draw them in. For instance, these cucumber pinwheels showcase the bright green cucumber swirled throughout – definitely more interesting and appealing to inquiring minds. Another trick to try to increase children’s healthier food choices and persuade them to lean more towards fruits and vegetables would be to add a dip of some kind. Try a veggie dip or a hummus (I added a little bit of hummus to go with the carrot and cucumber sticks). Children enjoy dipping and honestly, I don’t know many adults who don’t also enjoy dipping. In fact, according to a study in the Journal of the American Dietetic Association, dipping increases children’s vegetable consumption by as much as 80%! Perseverance is important! 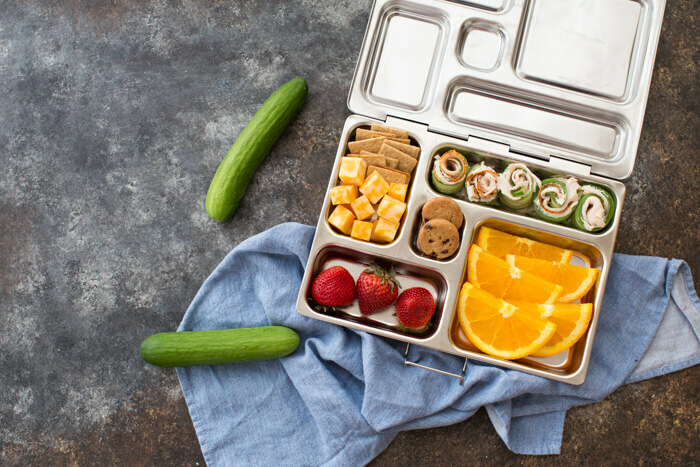 Don’t get completely discouraged and throw in the towel too early if your little ones return home with some of the healthier items still inside their lunchboxes. It’s all about exposure and even if they don’t eat their fruits and veggies every single time, the more their taste buds mature, they will be more likely to develop a taste and liking for them. So, keep offering these healthy choices. It’s not in vain, I promise. After weeks and weeks of assembling lunches it’s easy to understand that a creative roadblock might hit. 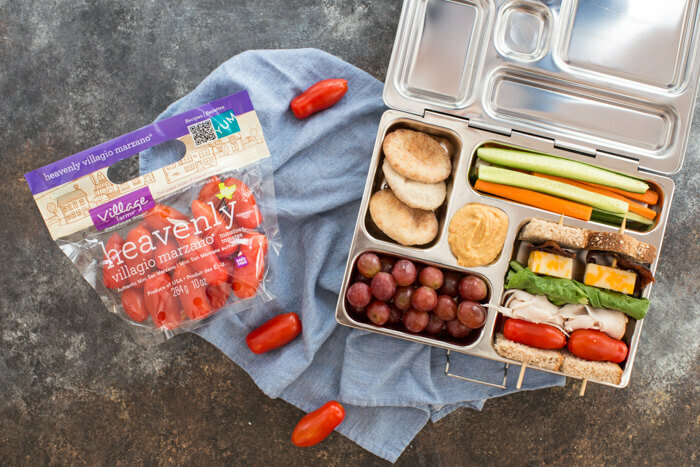 I’ve prepared several Sandwich Free Kid Friendly Lunch Box Ideas that are quick to assemble, nutritionally balanced, and incorporate kid favorites alongside foods that may be new to them. BLT Kabobs with hummus, carrot and cucumber sticks, pita chips/bread, and grapes. 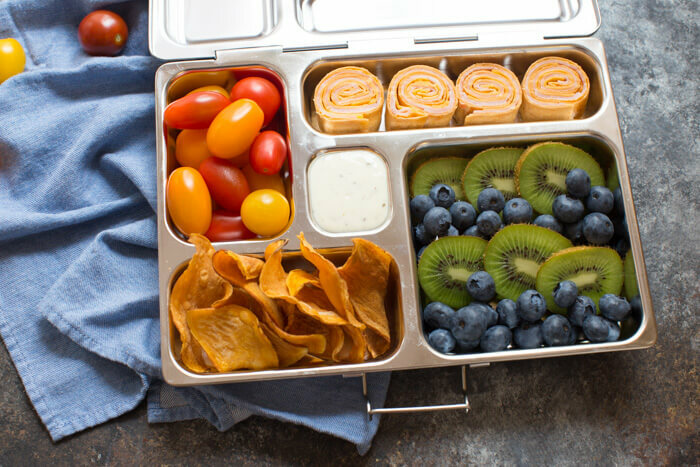 Ham & Cheese Pinwheels with sweet potato chips, kiwi and blueberries, Village Farms True Rebel Mix® Tomatoes, and ranch dressing for dipping. Spread veggie cream cheese onto the wrap, lay 2-3 slices of ham & cheese flat onto the wrap. Roll up the wrap gently but tightly to be sure it keeps its shape. Cut into 1 inch slices. 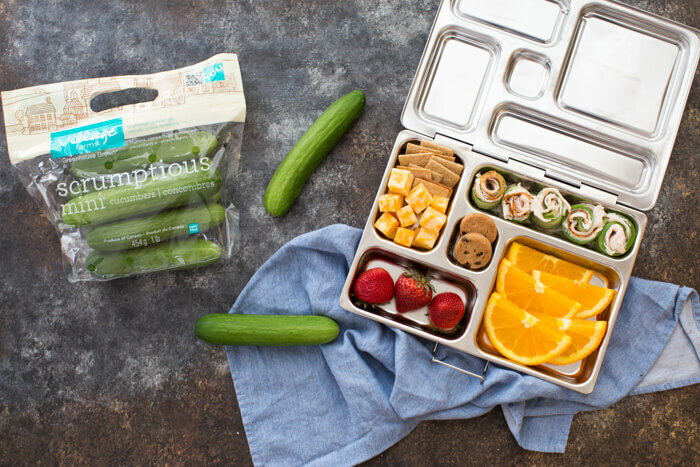 Cucumber Roll-ups with cheese cubes, wheat crackers, orange slices, strawberries, and mini chocolate chip cookies. This recipe works best with Village Farms Scrumptions Mini® Cucumbers. Use a mandolin or vegetable peeler to cut long thin strips from the cucumber. Using a paper towel, pat the cucumber strips dry and spread a thin layer of cream cheese onto the cucumber. Lay turkey inside and roll it up. What do you pack in your kid’s lunch boxes? Share below in the comments or hit reply to this email. I hope your kiddos enjoy these Sandwich Free Kid Friendly Lunch Box Ideas. Love how colorful these assortments are! My kiddo would love to open his lunchbox to any of these combinations! I LOVE bento style lunches! These are some great ideas! I hope everyone made it thru the first day! My littlest starts preschool in a couple weeks and I get emotional just thinking about it! This is such great post, especially since my kids don’t like sandwiches (i’m not sure they are even related to me!). Great ideas. Seriously, I would get so excited seeing this much variety in my lunchbox, even as an adult! I hadn’t heard of Village Farms, but will be on the hunt for their produce now – it looks stunning. 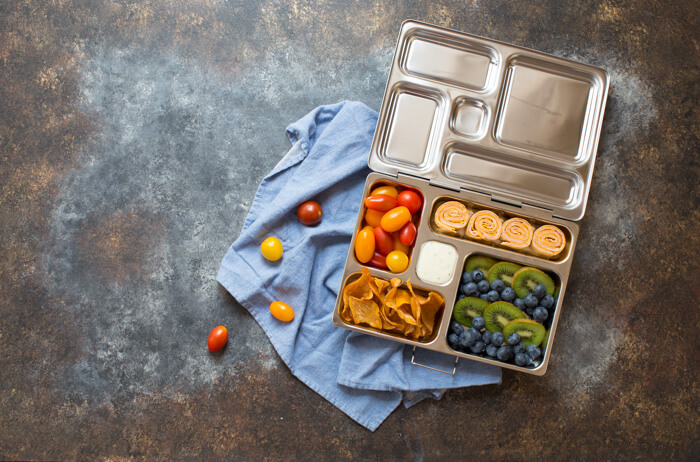 These are some GREAT lunch box ideas! It’s so good to have some new options with the school year about to start again. I don’t know that these would make it to my kids lunch box! They look so good! I would have to make a double everyday! Kids eating right is super important so thank you for these great recipes! We have these same lunch boxes and my kids love them. These look like some tasty lunches! 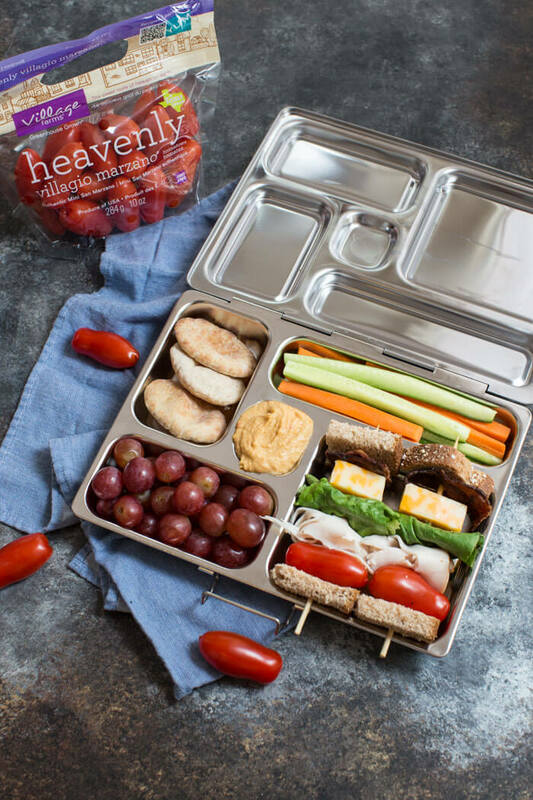 These lunch box ideas look so healthy and delicious! I’m sure these will be a bit hit with kids! SO much better for them! So cute! I hope one of my girls still lets me help with her lunch this year. I really miss making their lunches but at almost 14 and 9 they usually want to do them themselves. The youngest does let me help and does say surprise me sometimes which is fun, except when she tells me 10 minutes before we have to run out the door. Wow he’s starting early! It’s funny they usually behave better for others than for us! 😉 These are some great ideas! Starting pre-K is not easy but I’m sure your little one will adjust just fine. I love your ideas for lunch boxes. First – I adore the lunch box too! Second – I love the VARIETY here. I know I personally get sick of sandwiches every day. Why on earth would I expect my child to want them every day? 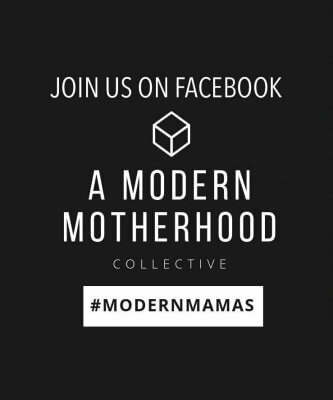 I have a just shy of 12 month old boy, and we are trying to transition from purees right now. And we are also trying to decide if we want to start pre-school at 2 or wait another year. It’s so hard! I completely feel you on both the excitement and the WORRY. Once they start school, its almost like you’re letting the world in, and I just don’t know if I’m ready to share my beautiful fun, funny little man yet! Thank you for the helpful feedback Jeni 🙂 The transitions are not easy– my son didn’t really eat purees from a spoon and has been very independent with feeding. Didn’t want us putting a spoon in his mouth, so I had to wait for him to pick things up and develop a little more to serve him mushy foods. The good news is you have a year to decide– you will know. Parker was totally ready and I wanted him around more kiddos, but he’s a “big kid” (even though he’s the youngest in the class). I think the other piece of it for me was that he is only going there 2 days a week for 3 hours– so really it’s just a little play date with friends and a bit more structure… away from mama. I love your whole post! It really is hard to feed our kids right. First off those Village farms veggies look wonderful. I’ll be looking for them. I just love your cucumber rolls and those cool lunch boxes. Aw, thanks Ginny. You can definitely taste the difference with VF quality. Such a great idea! My ‘little one’ is almost 17 and I’m still putting things he says he doesn’t “like” in from of him and saying, “Try it!” Lol! Way to go Mom! Where can I get this bento box? Haha! So glad you like them. I had kiddos and adults in mind when building these boxes. This is GOLD! I don’t have kids, but my husband takes a sandwich to work everyday. I really want to start mixing up his lunches and sending him with recipes like these! Thank you Christine!! Just a little extra thought and lunch can be more fun! I also love the bento box bc you’re not dealing with plastic baggies or washing multiple storage containers. Yuck. I don’t see any reason why I can’t pack this as lunch for myself. Haha! Love how cute these are. You’ve got some lucky kiddos! Thanks Deryn! I agree with you on packing the lunch for yourself too. Big and little kids will love these meals. I’m always looking for new ways to make lunch fun and exciting for my girls. I love using cucumbers as a “wrap” for sandwiches. So many great ideas here! Can you tell me where the awesome bento box is from? I have been looking everywhere for one like this! !